In our article on 4 Impeller Types and Their Applications, we provided an overview on the most common types of impellers used in industrial mixing. 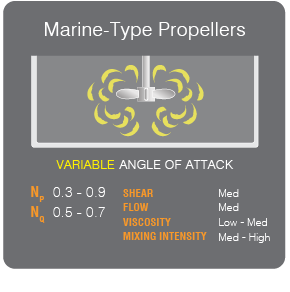 Now we’ll go into more detail about each impeller type and their influences on the mixing process. Our focus on impellers is due to the fact that they are the part of the mixer that does the actual mixing: as they rotate they create fluid flow. These flow patterns are the primary considerations when designing a mixer because creating the right flow pattern is critical to achieving the desired result. The most common flow patterns in mixing are axial (down and up) and radial (side to side) flow. 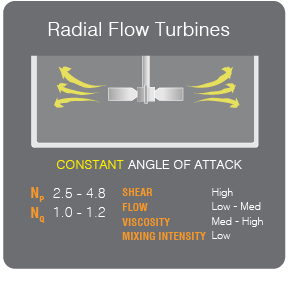 These flow patterns also describe the generic classes of impellers: axial and radial. Commonly used on marine boats, the propellers are often used in small portable direct drive mixer applications because they’re economical and efficient. However, in larger applications they’re seldom used because of their price and weight. 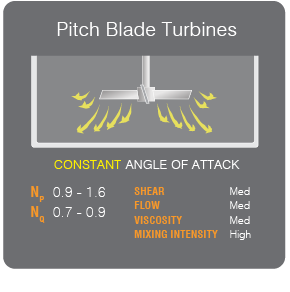 The pitch blade impeller is the most versatile impeller and was the standard until the development of the airfoil. They’re useful in blending two or more liquids and are effective in low bottom clearance with less liquid submergence. The camber of the blade increases the efficiency of the impeller, reducing its power / pumping ratio. A more technical benefit is the laminar flow created by the camber of this impeller. This camber reduces turbulence (shear) substantially. That is why it is selected for shear-sensitive applications as well. Unlike axial impellers, radial impellers are commonly selected for low level mixing (known as a tickler blade) or elongated tanks. 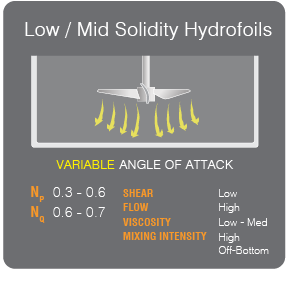 They typically give high shear rates because of their angle of attack. They also have a relatively low pumping number, making them the most sensitive to viscosity. Radial impellers do not have a high tank turnover flow like axial flow impellers. As you can see, the first step to meeting your mixing objective is to identify your desired flow pattern, which is dictated by the impeller. Next, you must consider the 4 main factors for configuring your mixer. From there, you must address the mechanical requirements of your mixing process: pumping or flow. The mechanical requirements to produce flow or torque per unit volume, the most important relationship in mixing, are explained next. Parallel-acting force where 2 layers inside the fluid slide against each other. This is in contrast to compression (perpendicular-acting force), tension (stretching force), and torsion (twisting force). Internal fluid resistance thought of as the “thickness” or “resistance to flow” of the liquid (i.e. water has viscosity of 1 centipoise vs hand cleaner, which is around 3,000 centipoise). Constant used to calculate power draw, unique to each type of mixing impeller. Constant used to calculate flow or pumping rate, derived empirically for each unique shape of impeller. Velocity of the fluid being pumped downward by the impeller. Rate at which the liquid is traveling upwards inside a tank past the impeller. State of a solid when its particles are mixed with, but don’t dissolve in the fluid and are capable of separation (i.e. sand in water). Separation of 2 immiscible liquids due to density variation. Such circumstances occur naturally: for example, due to variations in temperature in the atmosphere or temperature and salinity variations in the ocean. For axial flow impellers the impeller itself needs to be off the tank bottom to allow the top to bottom (axial) pumping to occur. The minimum distance from the tank bottom to impeller is 0.5 times the impeller diameter; the maximum distance is generally 2 times the impeller diameter, but ideally the impeller should be 0.67 to 1 times its diameter from the tank bottom. I have a qustion about ” stirring molten magnesium” and what kind of impeller use for that? do you know any article about that? Do you have any more information on the product such as specific gravity and viscosity? Any information on the tank size? Typically we would go with a dynaflow blade or pitch type blade depending on the application details. Would like to ask for the Marine-type propellers, what is the material that was used to make that carbon steel or stainless steel? And does that material suitable for coagulation? Our propellers are made of 316SS. 304SS is also suitable for coagulation. Which depth of an axial propeller reduces foaming issues generally? The depth of the axial impeller is not the most important factor, the type of impeller and the rpm are. In order to reduce foam it would be recommended to go with an air foil type blade which is low shear and a low rpm (<300rpm). Furthermore, the impeller should be placed about ¾ to 1 times the impeller’s diameter off the bottom. 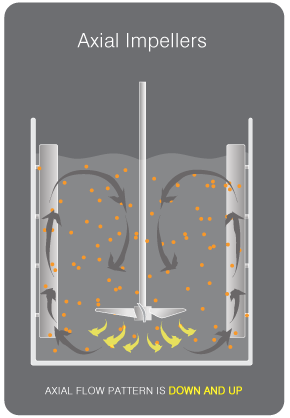 Pumping numbers are associated with impellers types and not flow regimes, as mixers typically don’t perform under laminar flow. Is there a specific question you had associated with the pumping numbers? I am designing a magnetic stirring station and I was wondering whether anyone knew anything about how to maximize the stirring ability of such a device. One obvious difference between a magnetic stirring station and a normal mixer is that the magnet rests on the bottom of the cylinder, whereas in most industrial mixers, the impeller is suspended some distance X away from the bottom of the cylinder. Since the stirring magnet is at the bottom, how will this impact the mixing ability of my device? Dynamix is engaged in the design & manufacture of mixers with paddle-type impellers. Thank you for your question, but unfortunately we cannot comment on your specific application. can any one do that plzzzzzzzzzzzzz…. I’m interested in axial impellers for our small cell. The problem we have is that we have currently employed a radial impeller (vane) and solids keep clogging on the wall and impeller stops. I was thinking maybe we could employ an axial impeller? But we want high shear at the same time. We have a system with two immiscible liquids and gas. And at a later time solid start to form. Do you think mixed flow pattern impeller would be the most ideal? For ideal results you would need to use an axial flow impeller at a higher speed, which produces higher shear. Our high-solidity airfoil impeller will aid in the gas dispersion and solids suspension. I am working for a paper manufacturing company and was requested to design an excel spreadsheet to give the basic specs for an agitator design. I am having a problem finding the power number needed for a density of 1200kg/m^3 with a viscosity of 1cPs, using a pitched blade impeller. What factors effect the power number and is it possible, in any way, to also calculate the pumping number without the use of graphs? At the conditions that you’ve supplied (SG = 1.2 & viscosity = 1 cps) assuming a turbulent flow regime, the power and pumping numbers of a standard pitch impeller will be 1.62 and 0.86 respectively. The pumping number is a measured number for each type of impeller and there’s no clear set formula to calculate it. Does the length of the shaft effect the motors performance? We have a set up that is barely working for us we have a roughly 5 ft shaft attached, and it would be helpful to use a shaft that was a couple feet longer; but we are concerned this may put additional stress on the motor causing it to be incapable of mixing our materials together. Can you please tell me about how the shaft length effects the motors performance? There are two main concerns with increasing your shaft length. First: The 7′ shaft will require a larger diameter to address Critical Speed Concerns. Second the Motor/Gearbox and Bearings will need to be designed to support the added stress of the longer shaft (Overhung Load). We need to do iron ore slurry and water mixing and than pumping it to Mixer to use the slurry in process.We have 3250 mm tank height and 3250 tank diameter.Which flow pattern is suitable axial or radial?As we will use all the product of whole plant in slurry form and than to reuse it in mixer. Lime slurry mixers should have impellers with airfoil blades because they promote axial flow that maximizes the area of influence. The diameter of the impeller should be sized at 0.3 to 0.5 impeller to tank diameter ratio to be optimal. 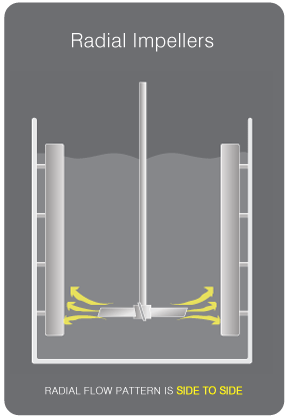 We typically recommend our Dynaflow™ airfoil blade for lime slurry mixing. what is best impeller type for mixing suspensions of medium viscosity taking in consideration that the tank size 1200 L , what is the right distance of the shaft , do we need two impeller shaft ? Thank you for the comment, an Application Engineer will be in contact with you to discuss your requirements. I want to select mixing vessel for pharma application for making suspension having viscosity from 1 to 3000 centipoise. Kindly suggest me the design of impller to be selected. It should be bottom driven or top driven.